Irish filmmaker and playwright Martin McDonagh writes and directs this crime caper. 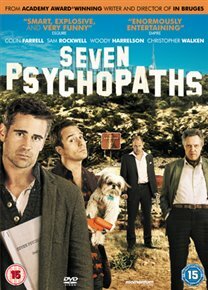 Colin Farrell leads the cast as Marty, a struggling screenwriter who finds himself entangled with the least desirable elements of the Los Angeles criminal underworld after his best friend Billy Bickle (Sam Rockwell) carries out an ill-fated dognapping scheme, stealing a Shih Tzu belonging to sadistic criminal kingpin Charlie Costello (Woody Harrelson). Christopher Walken, Tom Waits and Abbie Cornish co-star.